BTS was one of the first translation companies in the Netherlands to be awarded double certification: we have both the ISO 9001 and ISO 17100 certifications. These certifications are based on our detailed quality management system (QMS) in which our procedures are described. Our procedures are designed to optimise our service to our clients. A personal and efficient approach is vital. This way we ensure that we continue to supply the desired quality, in terms of service and translation. This standard is especially designed for translation services and aims to improve the transparency of the translation process. 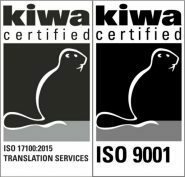 Our certification means that you can be sure that our internal translation process is based on quality, quality assurance and confidentiality. We feel it is important to play an active role in our own sector. We are therefore a member of the ‘Vereniging van Vertaalbureaus in Nederland’ VviN engages in promoting the interests and improving the quality of the translation sector. Our translators are certified native speakers. They know the ins and outs of your industry and are up to date on specialist terminology. If you send us a text for translation, we will always provide your translation in the same file format – unless you prefer a different format, of course. We will assign you a fixed contact, who can discuss your specific wishes and preferences with you. If you team up with us, we will take all your translation requirements off your hands. Feel free to send us anything you need translated – we’ll take care of the rest!